New Hampshire Bar Association, New Hampshire Criminal Defense Lawyers Association, Nashua Bar Association, District of Columbia Bar Association, Adjunct Professor at NH Community Technical College from 1998 to 2004. Criminal Law, DWI/DUI, Habitual Offender, Drug Defense, Sexual Assault, Federal Criminal Offenses, Motor Vehicle Offenses, Point Suspension Hearings, Domestic Violence, Restraining Orders, Stalking Orders. Born and raised in Maryland, Attorney Adam Bernstein attended the University of Maryland, Baltimore County, where he earned a Bachelor’s Degree in Social Work with a minor in Criminal Justice. Building upon this solid foundation, Attorney Bernstein attended graduate school at Duquesne university in Pittsburgh, Pennsylvania, where he earned a Master’s Degree in Social and Public Policy with a concentration in Criminal Justice. Taking the next logical step to continue his legal education, he then attended the University of New Hampshire School of Law (formerly the Franklin Pierce Law Center), where, in 1998, he earned his Juris Doctor. With a background focused not just on law, but on the social issues and the climate driving today’s world, Adam Bernstein was well-equipped to step into the world of criminal defense. Immediately following his graduation in 1998, he joined the New Hampshire Public Defender as a staff attorney, a job which he held until 2002, when he decided to enter into private practice. During that time and until 2004, he also served as an adjunct professor at the New Hampshire Community Technical College, giving back to the education system which served him well. Attorney Bernstein maintains a state-wide criminal defense practice, as well as a federal criminal practice in the United States District Court for the District of New Hampshire. He strives to ensure that he meets all of his client’s needs when they are in need of assistance in New Hampshire, a place that he now considers his home of over 20 years. Of course, Attorney Bernstein knows that there is more to life than just work, and juggles the daily routine of family time which includes caring for his young daughter as she continues to grow. 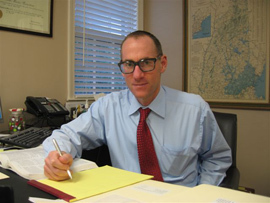 Attorney Bernstein also enjoys running and has proven to be an avid and capable runner. He has completed several marathons throughout his life, and, in 2006, completed the 110th commemorative Boston Marathon.